Only in Chicago can you be scared witless while enjoying a rip-roaring entertaining bicycle tour! Bobby’s Fright Hike – Halloween Edition bike tour is a three-hour guided adventure through Chicago’s spookiest spots. On this Chicago Halloween tour, you’ll be regaled with tales of our hauntings and horrors while rolling by some of the Windy City’s most famous landmarks, all cast in the shadow of night! Witness the cursed energy of the John Hancock Center, the lingering spirits of the SS Eastland, the trapped souls of the Iroquois Theater, and the ghastly elegance of the Congress Plaza Hotel. Perfect for thrill-seekers, ghost-hunters, Halloween parties, or anyone looking to have a chilling good time! The journey begins at the Bobby’s Bike Hike headquarters in Streeterville, where you’ll meet your terrifying and fun-loving tour guide! We will outfit you with a ready-to-ride Bobby’s bicycle, complete with front and rear lights to keep the group shining bright amidst the spooky darkness. Our fleet of comfort bikes makes riding a breeze, so you can keep your focus on the frights! The tour will then set out to see the John Hancock Center, home of the city’s most prolific curses and tragic demise. It’s one of the tallest buildings in Chicago and has an equally steep history of disaster. Next, the group will cruise over to the Chicago River, site of the horrific SS Eastland shipwreck, which killed more than twice as many people as the Great Chicago Fire. From there the guide will lead you into the Chicago Loop toward the Oriental Theatre, formerly known as the Iroquois Theatre. In 1903, a horrific blaze left hundreds trapped in the burning building and the alley beside it. It is largely believed that these souls still haunt the venue, even bringing their families to a show every now and again! Following that, you’ll trek to the South Loop’s Congress Plaza Hotel, one of the most infamous haunted hotels in the world. Here you’ll take a break and maybe hunt for a ghost or two in the lobby. Bobby advises against venturing upstairs—multiple rooms have been sealed off for a reason. Later, the frightening ride continues down to Grant Park and Museum Campus, two of Chicago’s most iconic waterfront parks. These centuries-old spaces are vast and haunting, the perfect place to share more ghost stories… including those of H.H. Holmes, a serial killer who preyed upon visitors to Chicago’s 1893 World’s Fair. Though his south-side murder castle has long been demolished, the spirits of his victims are still present all around. The tour finishes with a lakeside ride back to Streeterville, passing the dark depths of Lake Michigan, home to countless deadly shipwrecks, as well as the bright facade of Navy Pier, which long stood abandoned after the Second World War, a perfect place for paranormal activity. The tour concludes back at the Bobby’s Bike Hike headquarters after three hours and countless frights! At this point, you’ll know why Bobby’s is Chicago’s favorite company for nighttime bicycle tours! Named for Captain George Wellington Streeter, Streeterville is the bustling downtown district east of Michigan Avenue, north of the Chicago RIver. Streeterville was founded after megalomaniac George Wellington Streeter ran his boat aground nearby, turning the area into a wild and wicked Red Light district. The John Hancock Center is a 100-story skyscraper in downtown Chicago, designed by Skidmore, Owings, and Merrill. It’s only the fourth tallest building in the city, but by far the most cursed structure in Illinois. The Loop is Chicago’s bustling business district, named for its location within the rectangular convergence of multiple “El” train tracks. As one of the oldest neighborhoods in the city, the Loop has seen generations of business deals gone wrong… as well as the hauntings that follow. 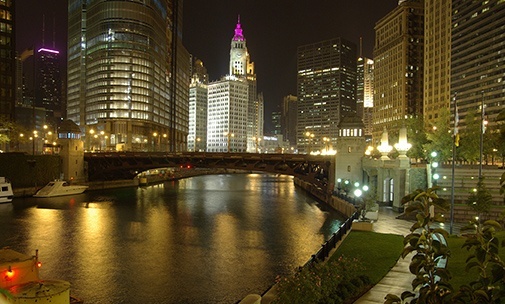 The Chicago River is the only river in the world that flows away from its mouth, and the reason for Chicago’s entire history of trade and commerce. Countless shipwrecks make for seriously spooky waters. The Iroquois Theater was a popular Chicago performance venue, but in 1903, it suffered the deadliest single-building fire in American history. Over 600 people were killed in the blaze. The theater was rebuilt as the Oriental, still in operation today. The Congress Plaza Hotel is a historic hotel on Michigan Avenue in downtown Chicago, which first opened in 1893 for the World’s Columbian Exposition. Over the last century, several rooms have been cordoned off for pervasive paranormal activity. 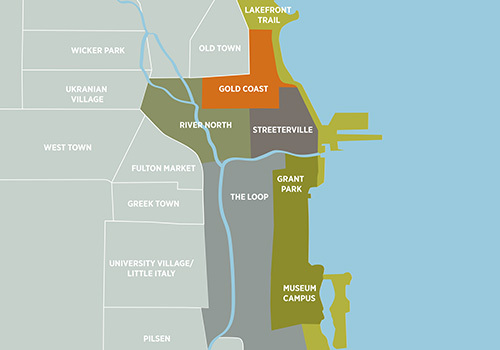 The South Loop is the vibrant neighborhood bordered by Harrison Street in the North, and Cermak to the south. The neighborhood is home to countless historic buildings, now occupied by colleges and universities whose students are constantly reporting ghost encounters. Grant Park, lovingly known as “Chicago’s Front Yard,” is a waterfront park located adjacent to the Loop. Grant Park host some of the Windy City’s biggest culture festivals including Lollapalooza and Taste of Chicago. The park is not without its own history of disaster, and the spooky remnants of such events can be felt by all who visit. Museum Campus is a unique piece of waterfront parkland located just south of the Chicago Loop. It’s the sprawling home of The Field Museum, The Shedd Aquarium, and the Adler Planetarium, three of the most highly-regarded museums in the world. After dark, the bright limestone structures loom large over the empty promenades, a terrifying sight to see.